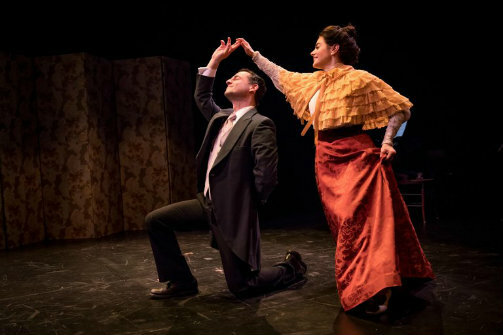 Max Von Essen and Emily Picerno in The Dreyfus Affair. Photo by Shirin Tinati. BOTTOM LINE: Using live orchestral music and an overtly presentational style, The Dreyfus Affair is an arrhythmic yet timely retelling of a historic tragedy. In 1894 France, Captain Alfred Dreyfus was a rarity. A highly decorated Jewish officer within the French military, Dreyfus managed to rise to an honorable position within a country plagued by centuries of culturally normalized antisemitism. It was this year, in 1894, that Dreyfus would be wrongfully accused, tried, and hastily convicted of high treason. The ensuing controversy known as “The Dreyfus Affair” brought much of the subterranean antisemitism to the surface of French culture, and divided the public into two primary camps: Dreyfusards and Anti-Dreyfusards. The controversy reached its apex as evidence exonerating Dreyfus emerged, and the popular journalist Émile Zola published his damning letter, J’Accuse…!, condemning the French military for their injustices against Dreyfus. Based on the new evidence and Zola’s incendiary message, Dreyfus was set free after five years of imprisonment, though he was never officially pardoned for the offense. The Ensemble for the Romantic Century tells the story of Alfred Dreyfus’s affair through a highly stylized, presentational piece of theater that uses choreographed transitions and specifically curated musical compositions. The scenes happen quickly, usually portraying key plot points, leaving much of the characters' motivations and internal lives to be explored through music and movement-filled transitions. A projection screen shows thematic graphics as well as some expositional information detailing the events of the affair and its aftermath. In most scenes the actors speak to each other, but occasionally turn to directly address the audience to share letters, personal asides, or sing. The costumes and set pieces seem to have been plucked right out of the era, including the many instruments: a string quartet, piano, organ, and harpsichord. Many individual elements of this production are very strong, especially the talent of the musicians and actors. The cast does a good job of bringing immediacy to their roles and genuine humanity to the historical characters. The musicians are extremely adept and a genuine joy to watch perform. The design, ranging from the basic scenery, props, and costumes, to the projection and lighting, is all well done and does much to recreate the atmosphere of the romantic era. The show’s overarching direction seems to err on the side of style over immediacy, which is perhaps a necessary adjustment for a script that focuses more on the sequenced events than on exploring character motivations. The play does much to stylize and theatricalize the events of The Dreyfus Affair, but very little to dramatize them, which would ideally involve delving into the thought processes of even the most loathsome figures. With few exceptions, the characters act entirely without doubt, as if everyone is confident in taking the actions that we, in hindsight, can see as either heroic or pitiful. Even if such confidence might be historically accurate, we get little justification for it, especially on the side of the French public, outside of their inherent and absolute hatred of the Jews. A redeeming exception to this is the writing and portrayal of Émile Zola (Peter Scolari), who appears multidimensional in his misgivings about Dreyfus’ conviction, and his own choice to break French law by publicly accusing the French military of misconduct. In the show’s most moving scene, we get to see and hear Zola’s dramatic condemnation of the French state, delivered directly to the audience, in a genuine, truthful, and varied act of heroism. In our tumultuous state of public discourse, it is important to look back to episodes where xenophobia and racism blinded people to their better judgment. The conditions of Alfred Dreyfus’s wrongful conviction are indicative of some of the same trends we now find ourselves fighting, as our political parties do everything to justify their supposed moral high-ground relative to the other, and public misgivings allow for acts of hatred and ignorance. In fact, as the show reminds us, the factors leading to The Dreyfus Affair are in many ways alive and well in current day France, as a statue of Alfred Dreyfus was defaced as recently as 2002. The Ensemble for the Romantic Century has made a brave and prescient choice in recounting these events and bringing to light how widespread divisiveness can lead to personal tragedy. Though the production is not without its particular lapses in storytelling, it is a fine example of historic, intellectual drama, capable of provoking thought and inspiring genuine fear for the justices that we too often take for granted. The Dreyfus Affair is by Eve Wolf. Directed by Donald T. Sanders. Set and Costume Design is by Vanessa James. Lighting Design is by Beverly Emmons. Sound Design is by Matthew Hottinger. Stage Manager is Margot Whitney. The cast is Max Von Essen, Mark Evans, Megan Picerno, Mark Coffin, Mark Light-Orr, Timothy McDevitt, Dee Pelletier, Daniel Rowan, Richard Waddingham, and Peter Scolari. Live music performed by Grace Park, Daniel Cho, Chieh-Fan Yiu, Nico Olarte-Hayes, Parker Ramsay, Max Barros, and Jake Chabot.